The contest for the first two spots in the platinum contest for schools taking part in the SLSCA division one tournament is hotting up with the deficit between the first two Jaleel and Abeysekera being only 325 votes. However, Anusha Perera who is in the third position is not far behind with 23,519. 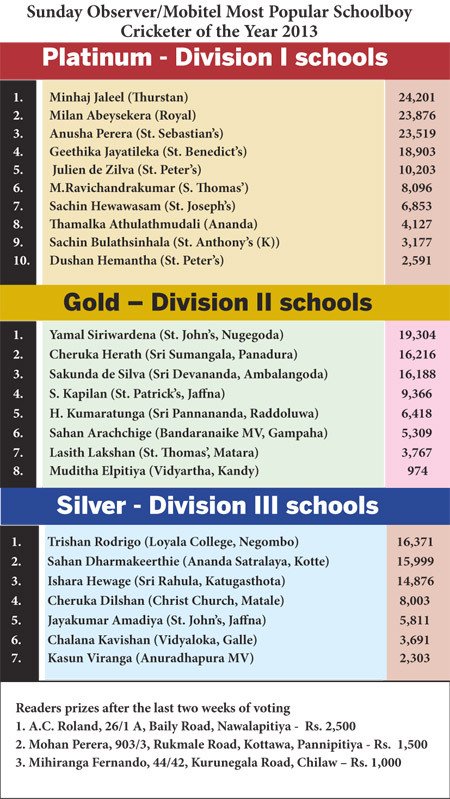 So it should all lead to a three cornered tussle.In the Gold contest for schools playing in division two Cheruka Herath of Sri Sumnagala, Panadura took the number two spot pushing Sakunda de Silva of Sri Devananda, Ambalangoda to number three. Yamal Siriwardene of St. John’s College, Nugegoda remained unmoved at the top polling 19,304 votes. In the Silver segment too, there was a change when Trishan Rodrigo (16,371) of Loyala College, Negombo took the lead from last week’s winner Sahan Dharmakeerthie (15,999) of Ananda Sastralaya, Kotte.